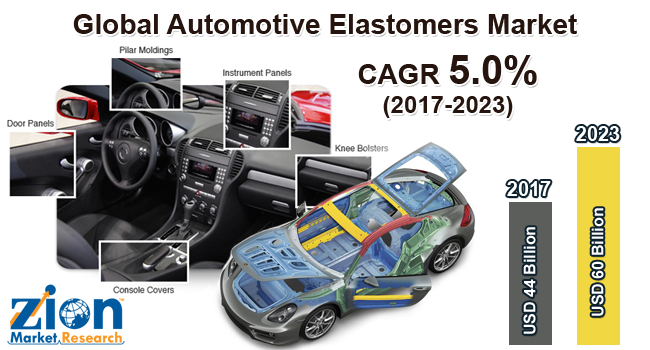 With the presence of a large pool of participants, the global automotive elastomers market is displaying a highly competitive business landscape, finds a new research report by Zion Market Research (ZMR). The Dow Chemical Company, JSR Corporation, BASF SE, SABIC Industries, Zeon Corporation, Arlanxeo, ExxonMobil Corporation, DuPont, LG Chemicals, and Teknor Apex are some of the key vendors of automotive elastomers across the world. These players are focusing aggressively on innovation, as well as on including advanced technologies in their existing products. Over the coming years, they are also expected to take up partnerships and mergers and acquisitions as their key strategy for business development, states the automotive elastomers market study. Citing an instance, in August 2018, Mitsui Elastomers Singapore Private Limited- a completely owned subsidiary of Mitsui Chemicals Incorporation- decided to increase the production of its Tafmer high performing elastomers at its Jurong unit. Analysts project that the strategic move to be aimed at fulfilling the escalating demand for high performing elastomers in the country. As estimated in this report, the global automotive elastomers market stood at US$ 44 billion in 2017. Witnessing a tremendous rise during the period from 2017 to 2023, the revenue in this automotive elastomers market is expected to reach US$ 60 billion by the end of the forecast period. The main products available in this automotive elastomers market are thermoplastic polyether block amides, thermoplastic copolyesters, thermoplastic vulcanizates, thermoplastic polyolefins, styrene block copolymers, fluoroelastomers, acrylic elastomers, nitrile elastomers, polyisoprene elastomers, butyl elastomers, and natural rubbers. Among them, the demand for natural rubber is relatively higher and the trend is anticipated to remain so over the next few years, notes the research report. “Massive application of elastomers in vehicles coupled with substantial expansion of automotive sector is expected to garner the growth of automotive elastomers market in the years ahead,” says the author of this study. Apart from this, rising product preference among the vehicle manufacturers to reduce fuel emission through use of light weight materials is expected to boost the product penetration across various markets. In addition, immense use of the elastomers for increasing the lifecycle of the automobiles is expected to accelerate the size of automotive elastomers market in the near future. Exceptional product features such as oil & gas resistance, heat resistance, and chemical resistance are likely to favorably leverage the business space over the years to come. Fluctuating crude oil costs along with oscillating production costs, however, are expected to impede the progress of automotive elastomers market in the years ahead. Furthermore, the disequilibrium between elastomeric prices and their performance can put barriers to the growth of automotive elastomers market. Nevertheless, extensive use of thermoplastic polyolefin for both interior and exterior vehicle applications is anticipated to generate lucrative avenues for automotive elastomers market in the upcoming years. This, in turn, will nullify the negative impact of hindrances on automotive elastomers market, reports the study. Regionally, Asia Pacific has been leading the worldwide automotive elastomers market and is anticipated to continue on the dominant position in the years to come, states the automotive elastomers market study. Economic growth, low manufacturing costs, and improved lifestyles are the key factors behind the dominance of the Asia Pacific automotive elastomers market. The high number of market players being headquartered in Asia Pacific is another significant factor that is supporting the growth of this regional automotive elastomers market. In addition, humungous product demand in the region along with growing trend of electric vehicles usage in the countries such as Japan and China are expected to influence the revenue surge of automotive elastomers market.